No more running around town trying to manage everything. Our expert therapists connect with your kids wherever you are. One less appointment you have to run to. Get Started. Call or Text (772) 494-1424. 1. Start with a free consultation. 3. Connect on your device. You are that much closer to Parent of the Year! Speak to a therapist and see if virtual speech therapy is a good fit. Pick a convenient time for the session. Use any high-speed device to connect with your therapist. Quickly determine if these services are a good fit for you. By definition, telepractice is the use of video communications technology to deliver speech language pathology services at a distance by linking a clinician to a client for assessment, intervention, and/or consultation. Essentially, we are using a platform similar to FaceTime or Skype to bring speech therapy services into your home. The difference between FaceTime or Skype is that our platform is HIPAA compliant, allowing for increased privacy. Our platform also allows for more engagement through the use of pictures and games. 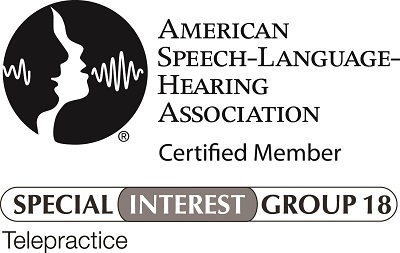 All speech services are provided by master’s level, licensed Speech-Language Pathologists. Treatment objectives are individually tailored. It happens in real-time, no pre-recorded sessions.